Department of Art | "Dirty Secrets" exhibit, with art from E&E grads and faculty this Friday! Home » News » "Dirty Secrets" exhibit, with art from E&E grads and faculty this Friday! "Dirty Secrets" exhibit, with art from E&E grads and faculty this Friday! 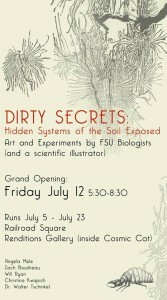 “Dirty Secrets” exhibit, with art from E&E grads and faculty this Friday! 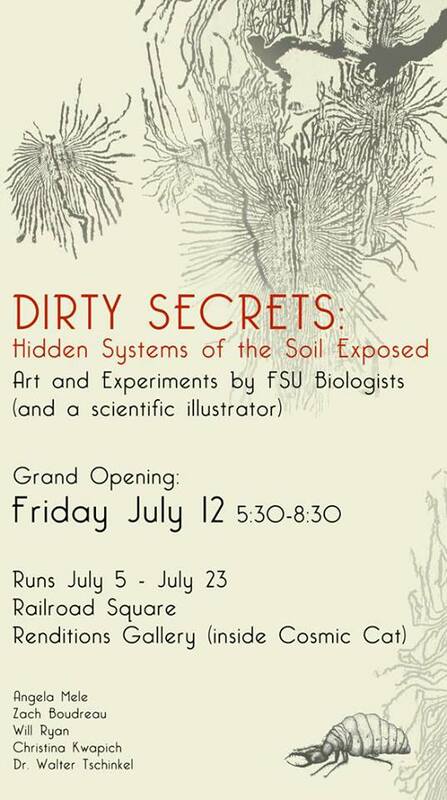 Some of the students and faculty from FSU’s Ecology and Evolution (E&E) have gotten involved in putting together an art exhibit centered around soil ecosystems and organisms. The grand opening for this show will be this Friday, 7/12, from 5:30-8:30 pm at the Renditions Gallery at Railroad Square (in back of the Cosmic Cat comic books store). See the attached flyer for more info.